As the head of the production team for this project, I worked closely with Marvin and Christian to faithfully bring their concept into reality. Using their original design data, material constraints and the installation location, I provided Marvin and Christian with the technical requirements for their production files. After receiving the files I made the final adjustments to ensure the files were production ready and optimized for laser-cutting. 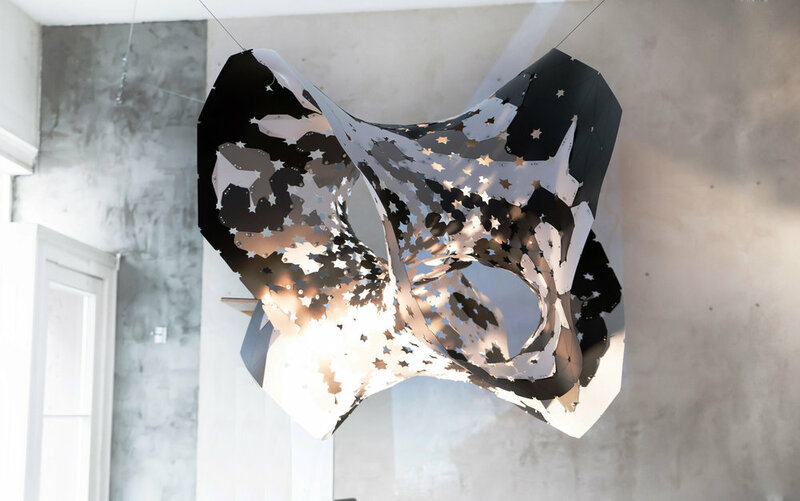 The Batwing Sculpture is comprised of over 70 unique shapes that were cut from sheets of Polypropylene using the lasercutters at Fab Lab Berlin. After I cut out all of the pieces, my production team and I assembled the sculpture by bending, interlocking and riveting all the pieces together like a giant 3D puzzle. We made a temporary frame to aid in assembly and also to protect the sculpture during transportation to the installation site. My team installed the sculpture at Spektrum Gallery for its exhibition, and the clients were really pleased with the result. It was a fun project to work on and great experience, both technically and in project management.